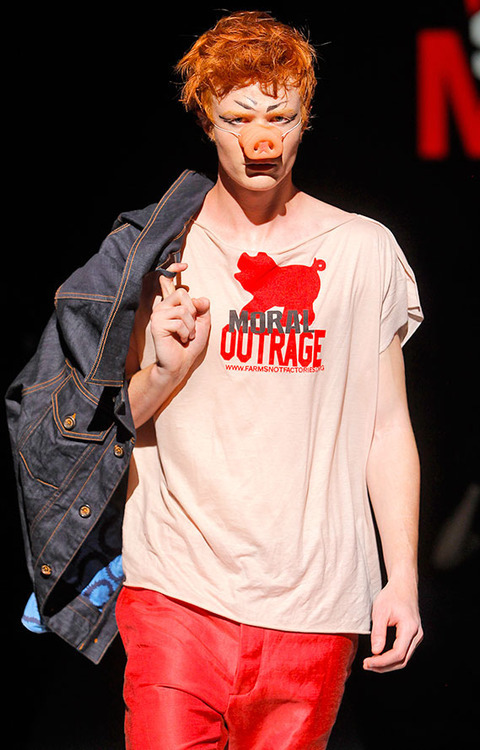 Vivienne Westwood demonstrated her support for The Pig Pledge campaign in suitably glamorous style – designing a t-shirt to express her Moral Outrage against factory pig farming and showcasing it on the models for her new collection. Imagine Tracy Worcester, now approaching middle age, a few years ago getting on a plane to Poland with a plan of operation and an aim to expose the cruelty to pigs, the inefficiency and the pollution caused by factory farming. All undercover she made a film called ‘Pig Business’. I saw it. Can you imagine getting that together? Actually doing it! I expect Tracy didn’t know where to start, but she found a way. I became Tracy’s friend for life. No animal should be born to suffer; it was like Bedlam on a mass scale for pigs: sickness, death and lunacy – of pigs. We don’t need this to happen. Visit her website www.pigpledge.org – She will explain that one American- owned company controls more than a quarter of the processed-pork market in the US and is now expanding in the UK and Europe. It is estimated that 70% of the 970,000 tonnes of pig meat that the UK imports each year does not meet UK welfare standards and yet retailers are entitled to label foreign meat as ‘British’ if it has been I asked Tracy what can we do?